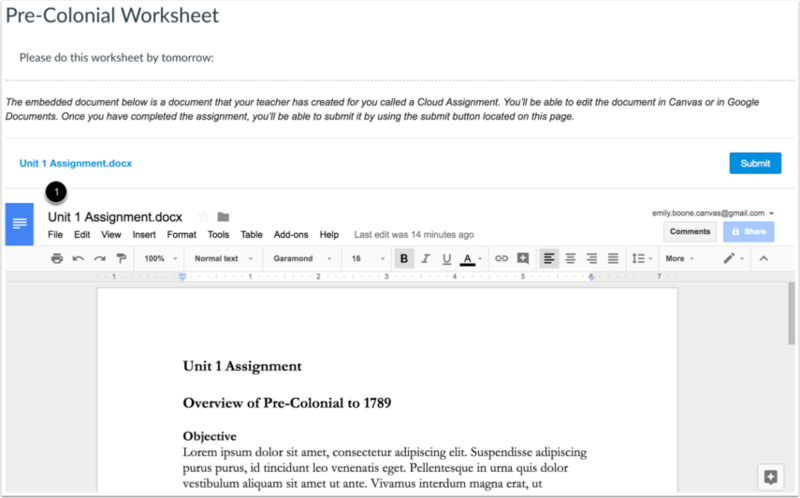 If your instructor creates a cloud assignment with a Google Drive file, you can edit the document directly and submit your changes as your assignment submission. When you open the assignment, Google Drive will create a copy of the file as your submission. 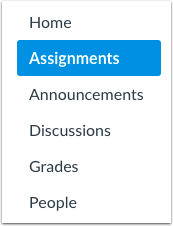 You can make changes per the assignment instructions, and submit the assignment directly from the assignment page. The copied document is also added to your Google Drive folder for the course. Cloud assignments are treated the same way as any other type of assignment submission. When you submit your assignment, your instructor will view the assignment exactly as it is when you click the Submit button. Even though cloud assignments can still be modified in the assignment page, any changes you make to the assignment after the submission cannot be viewed by your instructor unless you submit the assignment again as a resubmission. View the assignment in the assignment page. Make edits directly to the document as necessary to complete the assignment . Google will periodically save your changes . When you are ready to submit the assignment, verify that all edits have been saved, then click the Submit button. Confirm your assignment was submitted. If you need to make changes, you can edit the assignment again and submit the assignment as a re-submission. Previous Topic:How do I upload a file from Google Drive as an assignment submission in Canvas? Next Topic:How do I upload a file from Microsoft Office 365 as an assignment submission? Table of Contents > Assignments > How do I submit a cloud assignment with Google Drive? I've had several students click the link to open the doc in a new window, but their work doesn't copy over to the document that's embedded in Canvas. These same students have had their work successfully transfer over for other assignments, and they say that they're not doing anything differently. Any direction on how I can fix this issue? That is strange, especially since they've had it work before. I just did a quick test with a Google Drive cloud assignment and it seemed to be working in the document I created. I recommend contacting our Canvas Support team (How do I get help with Canvas as an instructor? ) or having your students contact Canvas Support (How do I get help with Canvas as a student? ) or reaching out to your institution's IT support team to get help troubleshooting the issue with this particular assignment. I know it's only been a short week since we replied to your comment, but I wanted to reach out and make sure that you were able to reach out to Canvas Support. Please let us know if there's anything else we can help with or if you have any further questions that you think we can help answer. Just so you know, we periodically remove comments from the Canvas Guides. If your comment thread here disappears in several weeks, you'll know that we've just done some housekeeping in an effort to keep the guides updated.